For the company “Efficient Recruitment” from Silkeborg, the requirement for success is always to choose the best tools available on the market: therefore, they have used HR-ON right from the start. The Chinese market is huge. There are distances of many thousands of kilometers, and there are more than a billion people. But this does not discourages Michael Folman, who owns Efficient Recruitment. When using the right tools, it does not matter whether you are in Denmark or Singapore; The process is the same, he says. Efficient Recruitment managed to achieve five years of continuous success in China and in other Asian countries. Part of the explanation is called HR-ON. “Our success is because we use the best tools available. Without them, we would not be able to find candidates and handle them efficiently and correctly, and we would not be able to keep our customers informed,” he affirms. For Efficient Recruitment, it is important that a tool like HR-ON is accessible and does not suffer from long periods of technical crash. Moreover, it must be logically structured and easy to use regardless language and culture. Otherwise, candidates will not spend time uploading their CVs. “It should not just be easy for us, but also for the candidates,” underlines Michael Folmann. According to the agency owner, HR-ON delivers on the demands. “It’s about controlling their data and their processes. And honesty. You have to say what you are doing and you must have transparent processes: both customers and candidates need to know what you are doing with their data. As part of the Asian expansion, Efficient Recruitment opened an office in China, but it has subsequently chosen to close it again. The philosophy of using cloud-based technologies like HR-ON simply overrides the physical office, which may still be a flight away from customers across the country. – We always have the entire database and all our processes with us. When there is Internet access, we are fully equipped. It does not matter to my customers where we are. They know we are always available, says Michael Folmann, who does not regard China’s distance as anything else than an manageable 12-hour flight ride, which he takes if the customers need a physical meeting. – Last I was in China, I was there for 11 hours. I landed at 6.50, switched to business mode, had three meetings and flew home again at 17.50. 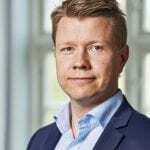 Michael’s Efficient Recruitment is based in Silkeborg, and with the help of tools like HR-ON, the 14 employees of the company can serve customers worldwide. Although Michael Folmann describes his business as an ordinary recruitment company. The fact that its employees cover no less than seven different native languages makes Efficient Recruitment a true international company. It focus especially on the so-called “white collar” – primary office workers – finding the right employees for their open positions. It is successful not only for Danish and Western companies with threads to Asia, but also for Chinese companies that recruit Chinese nationals. Even though the company closed its original office in China, the future may well offer satellites in several places in Asia in the coming years, if the progress continues. “We have been in Asia for five years with great, uninterrupted success, and if it continues, we will also have several offices out there, although in principle it’s really redundant. We all live now in the global village, concludes Michael Folmann. for us, but also for the candidates.